I spent an entire day focusing on one single aspect of the Samsung Galaxy Note II... the display. I did this by watching movies, videos, and viewing my favorite blog sites. Here are my thoughts. First and foremost, I'm hooked to the 5.5" diagonal size of the Galaxy Note II. I don't feel I can go back to "small" now. Viewing content on a phablet is the only way to live. And with the 1280x720 HD display this thing is packing, you can't do much better for your eye's pleasure. For this smartphone, Super AMOLED = Super DELICIOUS display! The colors are very vivid, the contrast is amazing, and the overall balance is just right for reproducing reality. It actually makes it better, in fact. It's not overdone at all, but just takes video to another level. Watching YouTube videos was a blast. The longest one I viewed was 1 hour and 45 minutes. It was a graphics-intense type of presentation, and it gave me goosebumps. It was as if I were watching a miniature LED TV. I enjoyed it just as much. And with headphones on, the experience was even better. The other activitiy that my eyeballs thoroughly enjoyed was viewing my favorite tech blog sites. Just sitting the Galaxy Note II flat on the table and thumbing through Engadget and TechCrunch was enough to make me get emotional. Lucky for me, I had a box of Kleenex nearby. It was just a beautiful and touching geek experience. And not to beat a dead horse, multitasking on the Galaxy Note II takes this smartphone to a level above all. Surfing through my pile of emails with a floating video window open is a dream-come-true for someone with ADD/HD of my magnetude. I will truly miss this feature. So here's the bottom line, folks... if you enjoy consuming video and blog content on your smartphone, and if viewing such content is high on your list of most-frequent activities, then the Galaxy Note II is a complete no-brainer. Period. Until they find a way for a geek to pack a 60" LED TV in your pocket with a portable battery, the Note II is the way to go. Samsung Galaxy Note II Review - More S Pen Tricks! If you can't tell, I'm probably headed towards an all-out recommendation for the Samsung Galaxy Note II. I have fallen in love with the device, and I'm discovering new tricks each day of my test. I thought I was done reporting about the S Pen, but I have more to share! The S Pen has so many features I may not be able to cover them all before my review period expires. So let's talk about some more super cool things that this amazing stylus can do for us. In the last article, we talked about hovering. I have to talk about this in more detail. I love the hovering feature of the S Pen because it gives you the power of a mouse. This is not something you can benefit from with any regular tablet or smartphone. When you hover the S Pen a half inch or less above the screen, the extra digitizer layer for the stylus will detect it and float a small circular cursor on the screen. This has many uses that i am thrilled about. First and foremost, it solves one problem I have had with my regular smartphone. That problem is forgetting which icons stand for "copy" and "clipboard". I am constantly selecting "clipboard" to copy and paste a phone number or name, only to have to start over again because I hit the wrong icon. With the Galaxy Note II S Pen, I can hover above the icon before selecting it. When you hover, a small popup will tell you what the function of the icon is. There's no more guesswork with small icons that are not labeled on the screen when you have this feature. Something else this crazy little thing does... pen gestures! Hold the magic button down and make certain pen strokes, and you get shortcuts. Make a carrot shape (^) and WiFi turns off. Make a star (*) and mute activates. Make a pound sign (#) and the phone number pad pops up. There are even more than this. But gestures create an entirely new smartphone experience. Back to the popup windows and using 2 applications at one time, the accuracy of the S Pen is invaluable. A fat finger cannot select with the dead-on accuracy of the pointed stylus tip. And the finger-mimicking rounded rubber tip styluses made for standard smartphones does not compare. Finally, I played around with the cropping feature. I can draw a circle around anything on the screen and copy that to the clipboard. Next, I can share that with a friend via text message or email. It's almost like clipping a picture out of a magazine, only easier. That has tremendous use for me. So that's the update to the S Pen. I still have a lot more features to discover and report about within the next few days. I'll find as many as I can and share it with you soon! As we continue with my Samsung Galaxy Note II test (thanks AT&T St. Louis), I have a couple of features to report that I practically love. I'm just now getting into some of the advanced functions of this phablet, so this is where it starts to get fun! What I want to talk about is the S Pen. I have yet to figure out all of the amazing things that the upgraded stylus can do, but we can start with a few of of things that jump right out at me. As I mentioned before, the S Pen stylus takes texting and note taking on a smartphone to a new level. When you use the Samsung keyboard, you can chose the handwriting input mode to compose text messages. It will recognize both plain lettering and cursive handwriting. The accuracy in translating my handwriting is exemplary. Instead of learning the heiroglyphic writing like the days of PDA's, all you have to do is write like you normally would. I can write on the screen and even go back to add letters to words, cross my T's and dot my I's, all before finalizing the text message. I was not expecting that to work so well. Usually, when you are entering text that uses handwriting recognition, you can't go back and edit a word that you have written while it is on the screen. Somehow, Samsung has figured out how to add letters to your own handwritten words after they have been recognized. This is truly amazing. It makes writing very natural. The next thing I noticed is the ability of the S Pen stylus to recognize how hard you are pressing on the screen when sketching. Apparently, there are 1200 levels of pressure sensitivity built into the stylus that allow you to sketch with amazing similarity to a pencil. I can tell a difference betwen the use of the stylus on the Galaxy Note I and the Galaxy Note II. They have improved the accuracy of the stylus, and when doing artwork, it has the uncanny ability to track exactly where the tip is for maximum effect and realness. Something else that I discovered by mistake was one of the hovering features. When you are on a website or using a social network that requires you to scroll up and down, all you have to do is over the tip at the top or bottom of the page and it will smoothly scroll the page in either direction. There are other features of the S Pen like hovering for text message previews and actual video previewing that I have yet to test out. We will talk about that in the next post that covers advanced S Pen use, so stay tuned! DOES THE GARGANTUAN SIZE OF THE NOTE II PRESENT A PROBLEM? My review of the Samsung Galaxy Note II from AT&T Wireless continues tonight with my discussion of a singular topic: size. Is the Galaxy Note II phablet too big? Are the critics right who claim it impractical, looks absurd, and has no serious potential as a smartphone? Well if the 5,000,000 people who have already bought a Note II are any indication, the critics can shut it. Obviously, we are dealing with a niche market that has serious depth. I am rounding out day 2 of my test, and I have been using the Note II all day long. I've surfed the web, made posts to the social networks, talked on the phone, and read emails. Here's my straight-talk opinion of the Galaxy Note II phablet and its enormous size after using the device for two straight days. The biggest fear I had before thoroughly testing the phone was not being able to reach the corners of the screen thanks to my small hands. I also had a fear of not being able to text by tapping or using Swype. I figured my one-handed operating days would be over if I bought one. Surprisingly, this is not an issue. I have small hands, but I have found a way to operate the phone with one hand. Just as I do with smaller smartphones, I balance the bottom of the Galaxy Note II with my pinky. My thumb can make it all the way to the left side of the screen to hit all of the keys when texting. Sure, I can't get my thumb to the top left of the screen, but it doesn't bother me. I can't reach the top left of my 4.3" Galaxy S2 handset, so there isn't much difference here. But I don't mind reaching around with my other hand to tap an icon on the top row while I'm enjoying the lovely display. 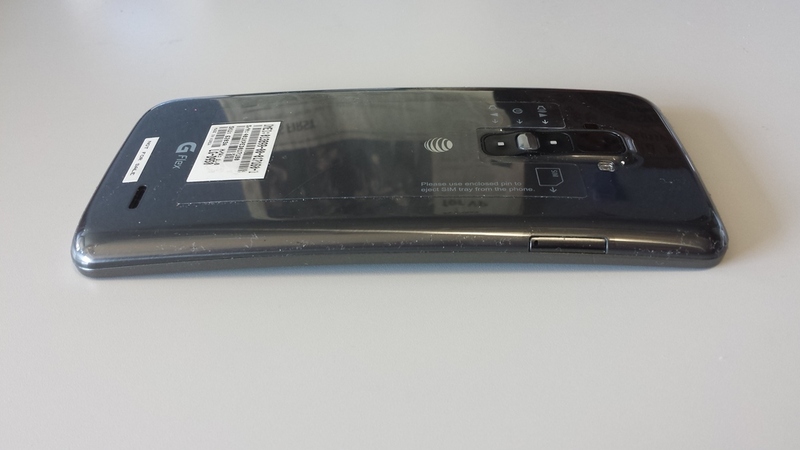 Holding the Note II while having a phone converstaion is a different thing. It does feel a bit awkward in your hand due to its size. I could care less what it looks like to other people, but I think I would have to get used to the feeling of this form factor while talking. It's not a deal-breaker though. The last point I will make is what my regular smartphone feels like after using the Galaxy Note II for several hours. When I pick up my Galaxy S2, it feels like a toy. The 4.3" smartphone that seemed so big after trading it in for my iPhone 4 now feels tiny. The Galaxy Note II is a much better looking device as compared to my good ole trusty Galaxy S2. After handing the phablet, my S2 seems to have a cheap feel. Plus it just seems too small now. My perspective has changed. I don't want the small size anymore. So the final analysis of the Samsung Galaxy Note II size is that it is a positive. The benefits outweigh the inconveniences. I definitely fall into the niche market of people who want a phablet with a gorgeous jumbo screen. If you have your eyes on this device and want to know whether or not the size will be a problem, you need to go to the AT&T store and give it a test drive. If the features and fantastic display outweigh your reservations on size, get it. You won't be sorry. Stay tuned for the next review where we will talk about some of the new features Samsung has packed into the Galaxy Note II. Got comments? Chat it out! 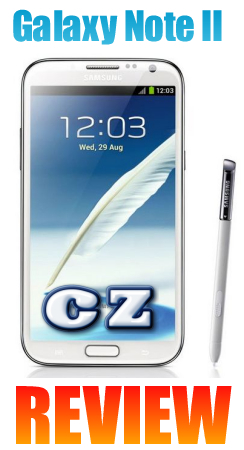 CZ Blog Reviews On Galaxy Note II Coming! I got great news from my AT&T St. Louis contact today that I will be receiving a Samsung Galaxy Note II for review! It will be arriving tomorrow. I will be doing a thorough test, and will come to a complete conclusion on this device. I've been dreaming about owning the Note II since the rumors first started swirling about the second generation phablet last spring. And after handling a non-functional display device, I had a brief mind-change on how much I thought I would like it. Is the Galaxy Note II a device that would meet all of my gadget desires, or is it too big for my small hands to handle as my primary smartphone? We will find out the answer once and for all. I think the contest will be whether or not I find that the Galaxy Note II has true "utility" for all the tasks that I would like to use it for. The enormous size could be offset by the functionality of the S Pen stylus. That will be the true test. There are some tasks that I believe the Galaxy Note II could be super useful for. If after using the Note II for a week proves this to be true, it might end up back on top of my list of possible smartphone upgrades. First and foremost, I want to try to see if I can eliminate the use of paper in my life. I'd like to try the Galaxy Note II in place of notepads and sticky notes while on my job. Instead of going to meetings with a legal pad and pen, only to end up with stacks of sloppy hand-written papers everywhere collecting in my office, I could collect all the info I need with the Note 2. There's something about using an actual pen and paper that sparks creativity and makes it esier to get your thought processes documented. With the Note 2, I could take notes and draw diagrams just as if I'm using a paper notepad. I'd love to be free of the cluttered paper mess in my life at both work and at home. Next, I would like to find out if the Galaxy Note II phablet would make a useful device for writing blog posts and updating all of my social media sites. I currently have to do this from my laptop and Galaxy S2 smartphone when I'm not at the desk in my man cave at home. Depending on how well the Galaxy Note 2 can convert handwriting to ASCII text, this could be a lot more handy than pulling out the big 17" laptop or using my tiny smartphone and fat finger to write posts. Lastly, I'm totally intrigued with the way you can draw on photos and crop out pictures from the web and save as GIF or JPG files. This could be a valuable tool when posting to Tumblr, or creating blog posts. I don't know if it will be as easy as it looks, so we will see. Even though the enormous Samsung phablet seems to be entirely too big for my hands to operate, I don't think I would have a problem holding it up to my face to talk on the phone. Bigger is better in that regard. I was never a fan of the micro-sized cell phones that were all the rage a decade ago. 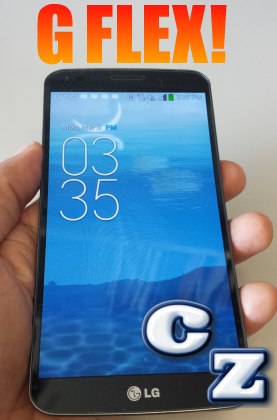 There's one feature of the Galaxy Note 2 that could counteract the size problem. You are supposed to be able to reduce the size of the touch screen keyboard and move it to the lower right portion of the screen. This would make all of the keys accessible with one hand. No need to stretch your thumb all the way to the left side if your hands are small. Stay tuned and I will be giving regular reports on my test of the Galaxy Note II. I will plan on including some audio and video posts along with regular blog posts. Then I will reveal my final opinion at the end of the test period! Big thanks to AT&T Wireless for the opportunity to review this breakthrough device from Samsung. This should be my most exciting review!